The latest excellence out of A24 has announced itself with the Thursday morning debut of the first trailer for First Reformed, written and directed by 71-year-old Hollywood legend Paul Schrader (Raging Bull). The thriller stars Ethan Hawke as Reverend Toller, an ex-military chaplain, grief-stricken by the death of his son. Toller’s already-strained faith is challenged further when he meets Mary (Amanda Seyfried), a member of his congregation who comes to him for counsel, along with her radical environmentalist husband Michael (Philip Ettinger). 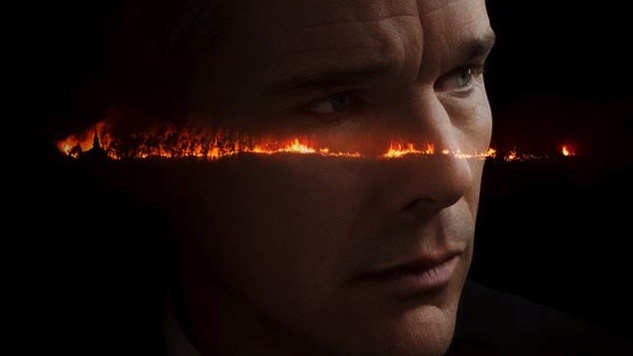 “It’s impossible to describe this movie without ruining it’s [sic] power,” A24 wrote on its social media channels in a description accompanying the First Reformed trailer. “All we can say is that Paul Schrader’s First Reformed might be the unholy lovechild of A Ghost Story and Taxi Driver.” The former film is a previous A24 hit and one of Paste’s top films of 2017, while the latter is a Schrader-scripted 1976 classic that is widely considered one of Martin Scorsese’s foremost masterpieces. There’s even a slick Taxi Driver reference in the trailer: a close-up on Toller pouring Pepto into his tumbler (a la Travis Bickle’s Alka Seltzer), the medicine’s sickly sweet shade of pink later echoed by a particularly stunning shot that appears around the two-minute mark. First Reformed, which also stars Cedric Kyles (aka Cedric the Entertainer), Victoria Hill and Michael Gaston, opens in select theaters May 18 before going wide on June 22. See the film’s chilling first trailer (and poster) below and thank the film gods for all A24 has given us.